PAI Group is a family-owned business with an aim to support offices around UAE. By grabbing every opportunity, the Group expanded across two continents with a consolidated turnover of more than $150 Million and over 500 employees. Today, PAI Group is operational in the United Arab Emirates, GCC countries, Africa, India and Hong Kong with over 20 companies. Prior to our work, PAI Group had no website or digital presence at all. 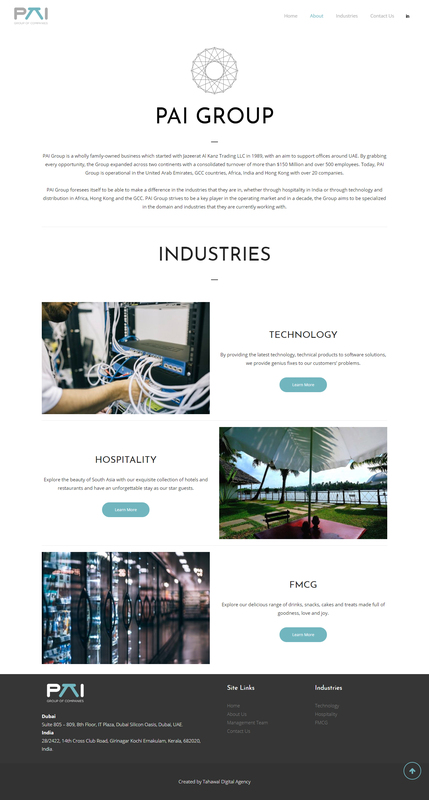 We worked with their executive management to fully understand the business and create a 10-page website that showcased the businesses the group owned that was modern-looking and was more aligned to the look and brand they were exuding.